Calabasitas is something I haven’t made in a while – it used to be one of my mainstays. I guess that happens, you make certain dishes all the time then the recipe fades away for a bit only to be rediscovered later. Calabasitas is like a Mexican version of ratatouille only it cooks in less time. 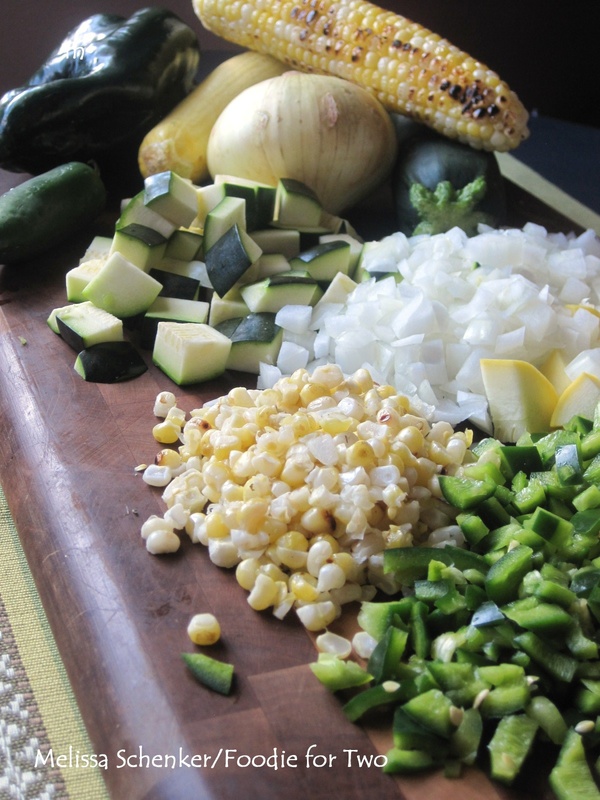 My version has fresh zucchini, yellow squash, sweet corn, (I’m proud to add that all three are Colorado-grown!) onions, Poblano pepper, tomatoes and cheese. My secret ingredient is a pinch of dried Italian herbs, which brightens up the flavors. The vegetables are sautéed until tender and it’s finished off with some cherry tomatoes, melted sharp cheddar cheese, queso fresco and cilantro. Even though it has all vegetables, it’s a hearty and filling meal. Coloradans like to brag about the good produce that is grown in our state – we are especially proud of the Palisade peaches and the sweet, tender Olathe corn from the Western Slope. The peaches aren’t available yet but I did see the Olathe corn in the store and snatched some up. For more flavor I grilled the corn but you don’t have to, in fact this is great with frozen corn kernels when fresh is out of season. The vegetables take about a half hour to sauté, and I love that there this is melted cheese on top. It adds a velvety richness and lots of flavor. I served mine in individual serving dishes but you can serve it directly from the skillet; sprinkle the tomatoes and grated cheese on top of the vegetables and put the skillet under the broiler for a minute or so until the cheese gets nice and bubbly. Add the garnishes and serve with warm corn tortillas – dinner is ready. Heat a large oven-proof skillet over medium heat. Add about 2 tablespoons olive oil, just enough to coat the bottom of the pan. Turn the oven broiler to high. Sprinkle the tomatoes over the vegetables and follow with the grated cheddar cheese. Broil for 2 to 3 minutes until cheese is bubbly. Garnish with crumbled queso fresco cheese, fresh cilantro leaves and fresh cracked pepper (optional: thinly sliced jalapeno rounds). Serve hot with warm corn tortillas. Optional Flavor Boost – Quick Grilled Corn: Heat grill to medium-high. Remove husks and silk from corn. Lightly coat the corn cob with olive oil and season lightly with salt and pepper. Grill corn, turning often, for 5 to 8 minutes until the kernels start to soften and get browned. Safely remove kernels from corn with chef’s knife – lay grilled corn on cutting board and place your hand flat on top, with index finger and thumb in the middle of cob (not hanging over the cutting side). Slice knife down the side of the cob, parallel to the corn, to remove kernels. Keep turning corn until all kernels are removed. 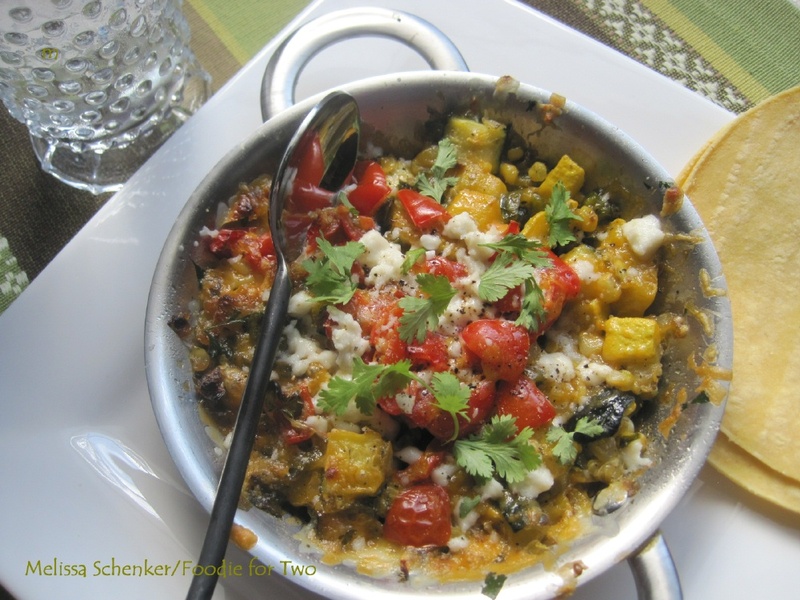 This entry was posted in Dinner, Mexican cuisine and tagged Cherry Tomatoes, Corn on the Cob, Onion, Poblano Peppers, Queso Fresco cheese, Sharp Cheddar Cheese, Vegetables, Yellow Squash, Zucchini. Bookmark the permalink. This is a wonderful dish and have to retry it soon. 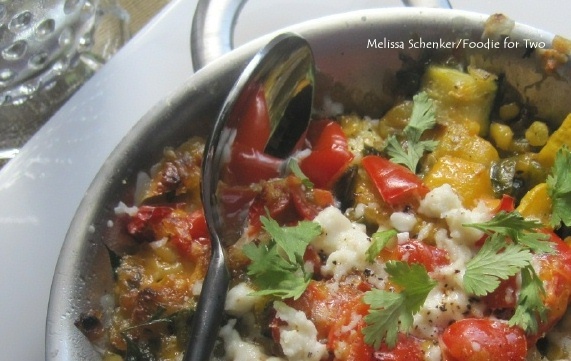 Thinks sounds so yummy – I haven’t made this since living in Tucson and look forward to trying it again! How is that you have so many southwestern style recipes? Could it be that you’re from Arizona? I love it. Will share this on my FB and twitter accounts. Look forward to trying it to. Looks great! I love using local veggies and fruit. Thanks! I know you have your “Meatless Mondays” – hope it’s an inspiration for you.